Someone’s project, this mauve and mint green 1953 Ford F-100 resides in the industrial area lot across from the Viterra grain elevator, a vehicle waiting for its next drive, more utility upon pavement. The mood of this photograph attracts. Its subject waits upon an earthly creator with abundant resources to transform ‘what was’ into ‘what will be,’ a creator who will set new purpose for this vehicle – breathing life into it, again. What this vehicle will become depends upon the creative imagination of those who will bring restoration. Listening to U2 sing about INXS lead singer Michael Hutchence in Gone, from Best of 1990-2000 [B-Sides]; then it’s Gillian Welch singing Revelator from her Time – The Revelator album; finally it is Dar Williams singing Mercy of the Fallen from her album The Beauty of the Rain. 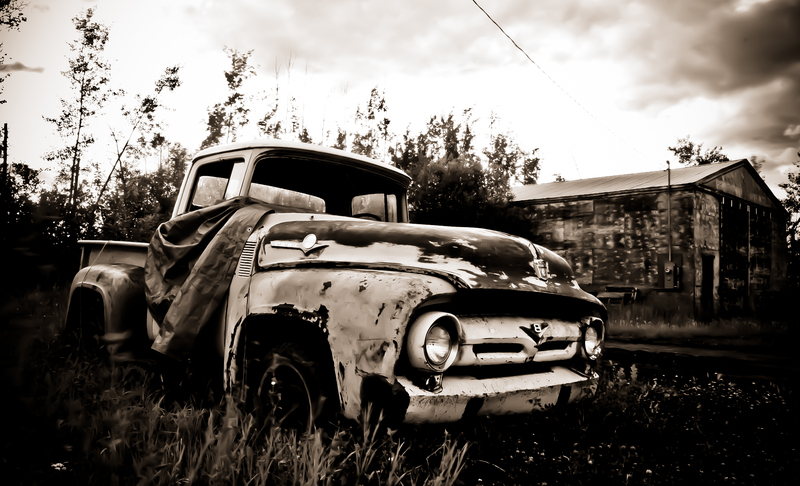 The way you capture these old trucks is amazing! I love seeing them. Guess it takes me back to a simpler time in life. Thanks for the memories.